I bet that you’ve already seen a battle rope somewhere, since you are interested in getting one. 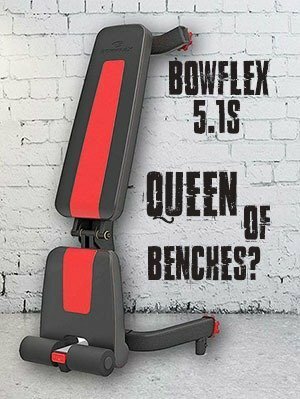 It might have been in your local school, or a gym, or during CrossFit training, or perhaps when you were in the army. It actually does not matter. What matters is that you need to get the very best battle ropes that are currently available on the market. But what exactly makes one battle rope better than the other? Let’s find out. What to Look For When Getting Battle Rope? There are certain qualities that you should check before ordering your rope. I have outlined them in bullet points below. You should check what the rope is actually made of. For example, if it’s a polyester blend, or 100% Dacron, which is usually of better quality than the blends of PolyPro or PolyDac. Basically any material with high-tensile strength will do the job. Some ropes come without any kinds of handles, why others (most of them) have different kinds of grips. It can be heat-shrink handles, naked or made of different material. Another important thing to look for here is the length of the grips. Length can be important as well in case you have limited space or require specific length for harder/lighter workouts. Of course as the logic dictates, the short and thinner the rope, the easier workout. Luckily, most of the battle ropes come in different sizes. Do not forget that it’s the length of the entire rope, thus you have to divide it by two to get the length for each arm. The width can be also important in case you have very small hands, then you’ll have to choose thinner ropes. Last, but not least thing to look for in a battle rope is the cover material. 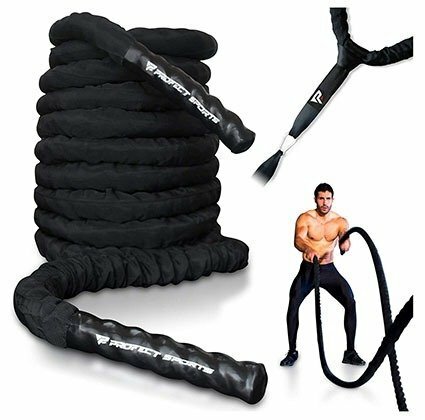 Most battle ropes come in nylon sleeve cover to prevent friction. If your chosen battle rope won’t have sleeve cover, then make sure the material which it is made of won’t fray or leave fibers. 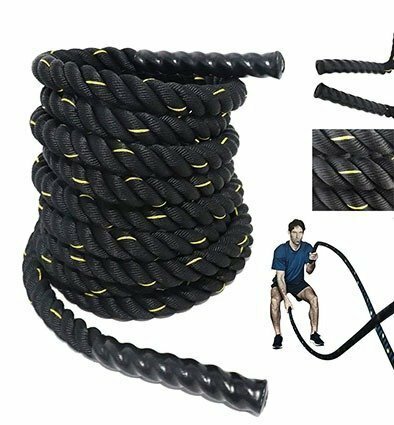 Okay, now when you know what to look for when getting a battle rope, it’s time to check the guide of the 8 best battle ropes that are worth your money (according to my personal opinion). Note1: The ropes in the list are not aligned by any particular order. Note 2: Some manufacturers name their battle rope with plural – ropes, but every battle rope from this list is just ONE rope in the package. I’m mentioning this because some customers are confused whether you get two ropes or one. Well, you get one. 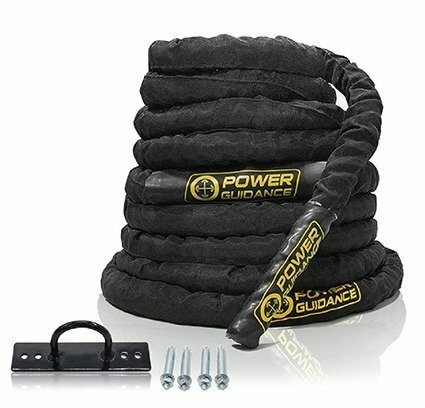 The first rope that made it to our list is made by Power Guidance. The rope is made of 100% Dacron material, which is a bit durable than the blends of PolyPro and Polydac materials, but is also heavier. It’s covered in nylon sleeve, which protects it from friction. The 7.5” long heat shrink handles provide comfortable grip and protection for your hands. The manufacturer also states that the handles should never come off. The thickness (width) of the rope is 1.5” inches and it’s available in 3 lengths: 30 ft, 40ft and 50ft (9.1, 12.2 and 15.2 meters). 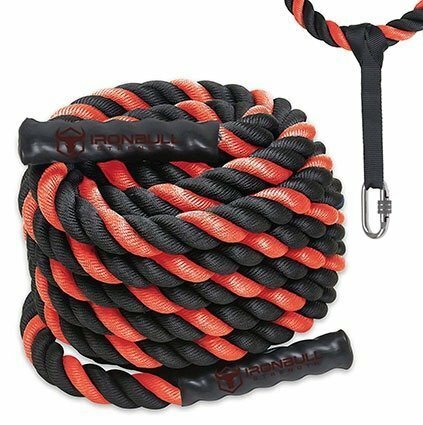 The next fella which made it to our list of best battle ropes is manufactured by AmazonBasics. The rope is made of durable polyester blend and is made of 3-strand-thick design. Due to the high-tensile strength it should remain in the original quality, without fraying or loosening. It also comes with handles, but manufacturer did not mention any specifics. The rope comes in 3 different lengths (30, 40 and 50ft) and 2 width variations, 1.5”and 2.0”. Third on our list are the ropes made by Iron Bull Strength. They are made entirely of PolyDacron material for maximum flexibility. The rope is covered with nylon sleeve to prevent friction. The handles are heat-shrunk to the rope for hand comfort and should last years, without wearing down. What is different is that the rope comes with a two 2”x 16” double-sewn nylon anchor straps, which are included for free. It also comes in 6 variations, 30, 40 and 50ft with either 1.5”width or 2.0”. The fourth ropes that made it to our list of best battle ropes are made by Profect Sports. These ropes are made of high quality premium materials, a 100% PolyDac. The handles are coated in heavy-duty material (rubber of some sorts) for a comfortable, yet firm grip. The entire rope is covered in DuraMax protective sleeve. The purchase includes 2 heavy-duty anchor straps and stainless steel carabineer. 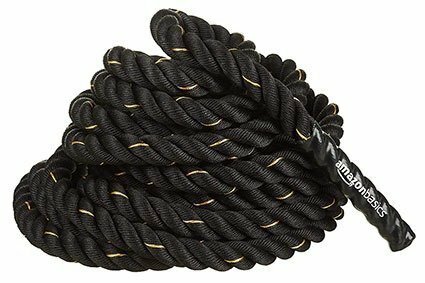 This particular rope also comes in 6 different variations, 30, 40 and 50ft and either 1.5”width or 2.0”. 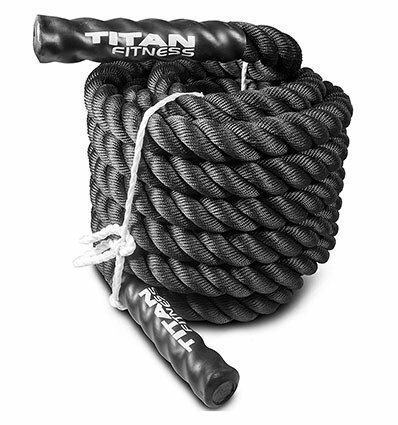 The fifth rope on our list is manufactured by Titan Fitness. It’s made of heavy-duty material, but unfortunately, the manufacturer did not leave any specifics. The rope has long, comfortable, rubbed handles for protection and secure grip. This particular rope can be used as a climbing rope as well. It does not have any protection sleeve, but despite this, the manufacturer claims its weather & water resistant. The anchor is not included and it also comes in 6 different variations – 30, 40, 50 ft and 1.5”and 2.0” width. The sixth on our guide list of the 8 best battle ropes is manufactured by Grande Juguete. Not many people know that this brand also manufactures skateboards (lol, right?). The rope is made of 100% Poly Dacron. The design is 3-strand twisted Polydac and it is wear-resistant. The waterproof sleeve protects the rope from friction and fray. The heat-shrink anti-skid handles are very easy to hold and are quite comfortable. The rope has also yellow track-line. The rope comes in 3 different sizes, 30, 40, 50 ft. The next on our list is the battle rope manufactured by Blissun. It is made of 100% PolyDacron just as the previous one. It also has the same 3-strand twisted design. Heat-shrink grips are placed at the ends for comfortable and tight hold. 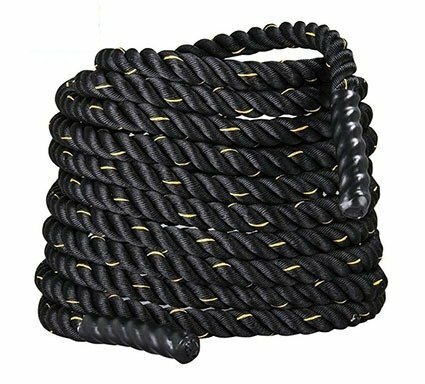 The rope is wear-resistant according to the manufacturer and also comes in 3 different sizes, 30, 40 and 50 feet. 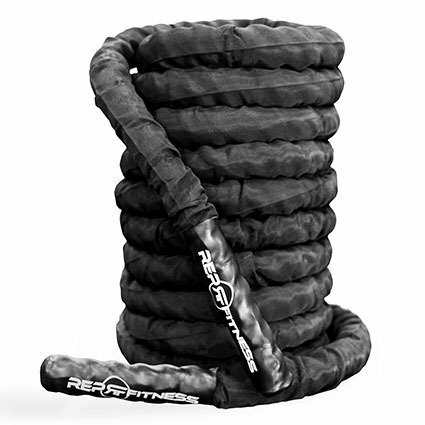 The last, but not least one our list of best battle ropes are the ones made by Rep Fitness. Seconds version produced by Rep Fitness features battle ropes made of Poly Dacron with 3-twist braided design. The entire rope is covered by though, tubular nylon sleeve, so you can say goodbye to friction and fray. It also keeps dirt from getting into the rope braids. The longer heat-shrink handles provide maximum comfort and perfect, tight grip. The rope comes in 6 variations, 3 sizes (30, 40, 50 ft.) and 2 diameters – 1.5” and 2.0”. Unlike most of the competition, Rep Fitness provide s3-year warranty. That concludes our list of best battle ropes on the market that are worth your money. Now it is up to you to decide whether you prefer ropes covered by sleeve, or if you prefer to see a tracking line. Some of the ropes do not include a rope anchor, but I would not worry much about that. You can either wrap the rope around something else, or simply purchase proper anchor for a few bucks.